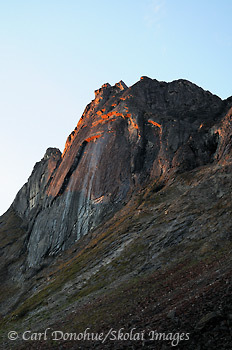 Arrigetch Peaks at dawn, Gates of the Arctic National Park, Alaska. Please click on the image above to view a larger version of this photo. Here’s another photo from the trip to the Arrigetch Peaks we took back in August. This scene appealed to me, the light striking the underside of the crags’ overhang, yet most of the rock in shade. It was a wonderful morning, with some gorgeous early light that disappeared all too soon, the sun spent most of the day behind this ridge, but the view up and down the valley was simply stunning. This entry was posted in Adventures, Alaska, Backpacking and Hiking, Gates of the Arctic National Park, Landscapes and tagged Arrigetch Peaks, Gates of the Arctic National Park, Landscapes, scenics on October 12, 2011 by Carl D.
Awesome back country travel company is right!!! One of the Best for sure! Thanks for the kudos man. Hope life’s good for you and yours!